The ViewPad 10 Pro is now on the market and runs Gingerbread. Its updated OS adds a sizzle to this tablet after having previously viewed it running Android 2.2 a few months ago. The ViewPad 10 Pro will feature a 1.3 MP front facing camera and a micro SD slot for further storage options. Its processor is a 1.5GHz Intel Atom processor Z670 (single core), 2GB of Ram, 16GB and 32GB flavors all on a 10.1″ 1024X600 resolution display. 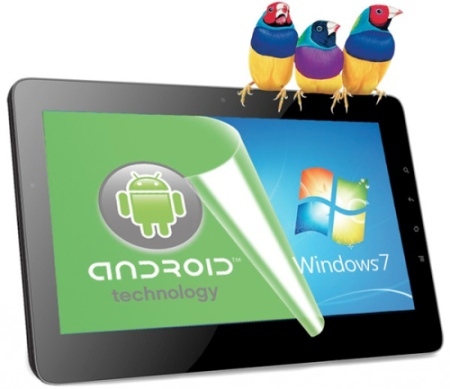 Due to a competitive market of tablet with dual-core NVDIA Android Honeycomb CPUs the View Pad’s single core CPU may pose problems in this consumer driven market. The 32GB ViewPad will come with an estimated sticker price of $699 and include Windows 7 Professional while the 16GB model can be had for less than $599. The 16GB version will operate with Win 7 Home Premium. On Windows 7 Android will run in a virtual environment and can be launched via a single click of the Android OS App with fast and stable performance.